The final infantry regiment in the Quiberon Expedition project is now ready; the Royal Louis Regiment (also known as Le Régiment d’Hervilly). Having already completed the Loyal Emigrants and the Royal Marines, there is one more regiment I’d like to complete and that is the Royal Artillery. I should remind everyone that the inspiration for the project was this page of illustrations displayed in Lymington’s St Barbe Museum. 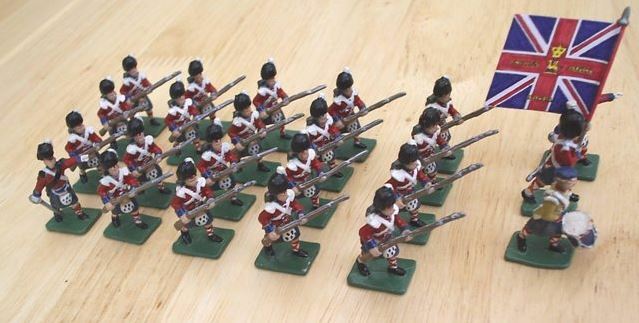 Here are my entire group of Royal Louis Regiment figures, made using Strelets French Line Infantry in Egypt set. The Royal Artillery will be the final group in this project. 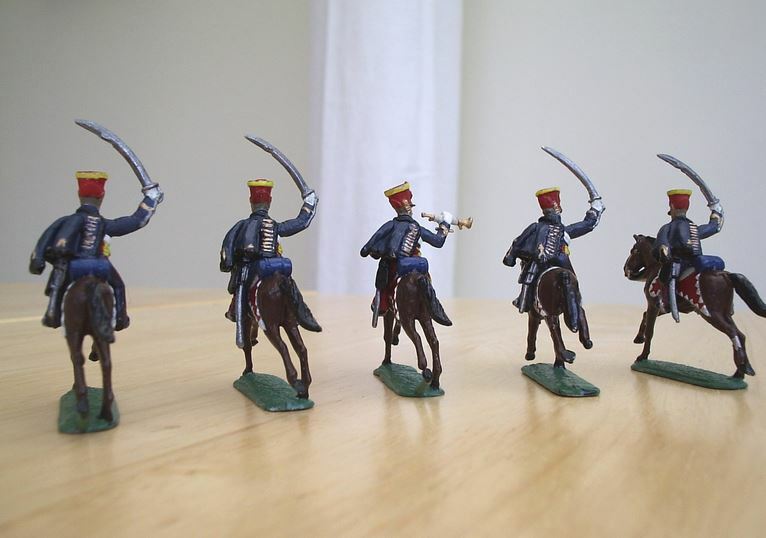 But they may have to wait – I’ve got my teeth into yet more Napoleonic cavalry! More on that in a future post. Two of my regiments in the Quiberon Expedition project are now finally finished; the Loyal Emigrants and the Royal Marines. Just leaves the Royal Louis Regiment (also known as Le Régiment d’Hervilly) to finish off and then it’s on to the final figures which will be the artillery. In other news; I’ve added a new page to Suburban Militarism dedicated to Strelets’ Crimean War series of figures. The plan is to get back to painting some of this range and build up my armies, displaying them via links on the new page. Given the huge numbers of figures and diverse sets for me still to paint, this is likely to be an ongoing project lasting some considerable time! Some time last year, I took a little time out from the Nappy Cavalry Project to have a stab at something which had its genesis in a visit to the St Barbe Museum in Lymington during my holiday in 2015. The museum explores the history of Lymington and the New Forest and during my visit, I discovered a reference to the Quiberon Expedition. This was a royalist invasion of France in 1795 via the Quiberon peninsula by émigré, counter-revolutionary troops in support of the Chouannerie and Vendée Revolts. Some of the expedition force was based in and set forth from Lymington. 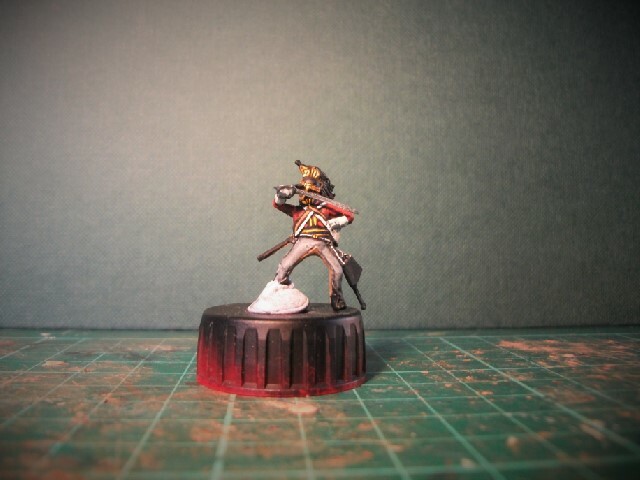 I made some progress (see original report here) but had to get back to the Nappy Cavalry Project. I think it’s about time I finally finished what I started! The St Barbe museum, I’ve since discovered, was formerly the St Barbe National School built in 1835. St Barbe (St Barbara in English) was also the location of a battle during the Quiberon Expedition. It seems that this is coincidental as the founder of the school’s charity was named John St Barbe. There’s a pleasing connection between my figures and the genesis of the name of the now nearly-200-year-old building of the museum. 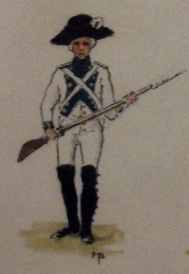 The museum’s own illustrated guide to the French royalist troops based in Lymington. The royalist forces amounted to a meagre 5437 men divided into two divisions. The first division commanded by Field Marshal Louis Charles d’Hervilly (3600 men); the second division, consisting of almost 2000 under Charles Eugene Gabriel which was to follow a week later, followed in turn by the Comte d’ Artois and 10,000 British soldiers which were to land and occupy Saint-Malo. It is the troops of the 1st division that my project has focused on. 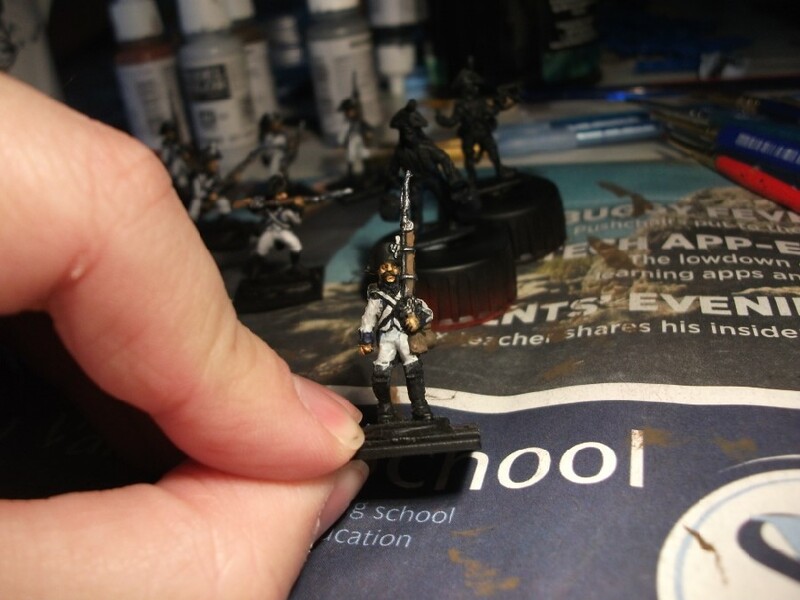 Each of the regiments have been painted in groups of a dozen or so. These progress pics demonstrate there’s still much to do, but the colour scheme is visible. 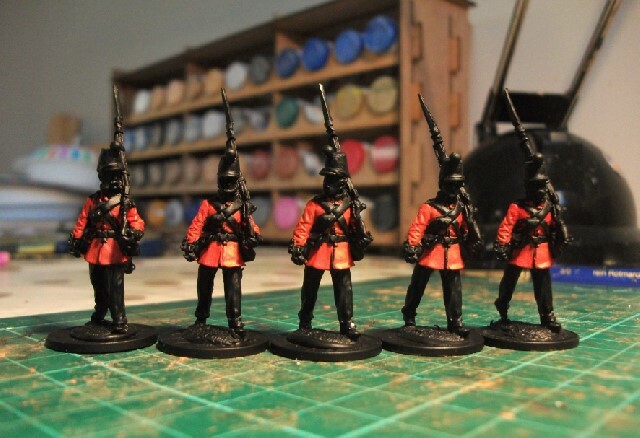 I’ll show the finished troops once these regiments are finally completed. 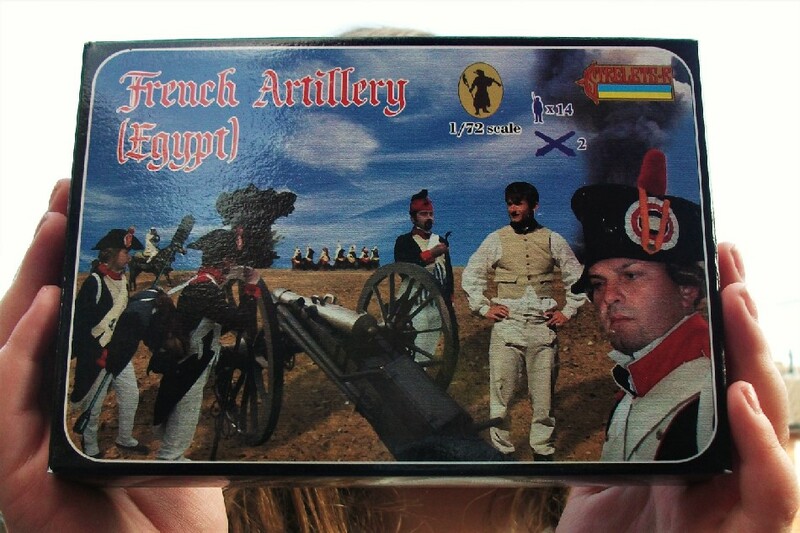 I’ll be using the Strelets French Artillery in Egypt set for the Royal Artillery which I’ve yet to start, but they are next on the “To Do” list. Having had some days off, I’ve been able to devote some time to tackling all those figures wearing scarlet that I mentioned in the previous post. 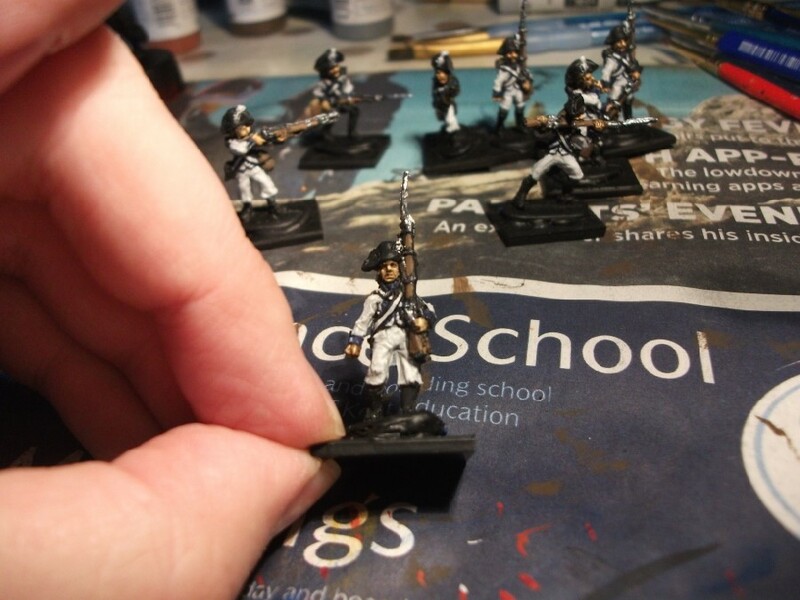 In progress: Men of the French Royal Marine Regt. The 28mm Perry figures have taken a back step while I’ve concentrated instead on the British Heavy Dragoons set by Waterloo 1815. After their terrific Prussian Hussars that I painted earlier this year, this set, I must admit, has been a disappointment. Firstly, the detail on the figures is nowhere near as crisp and clear as previously. I’m not sure whether it is a problem in the sculpting or with the mold, but it’s simply not as beautifully detailed, instead being a little bit smooth and vague. This makes for greater difficulty (for me at least) to get a decent paint job out of it. The horses are also poor, there being only a miserly two poses for the entire set! The detail is again less distinct and crisp than the wonderful figures of their previous sets. But my biggest bugbear is that the riders simply didn’t fit on the horses! Feedback from a friend on Benno’s Figures Forum suggests that this problem might simply be restricted to me, and I’ve unluckily received a bad kit! For other’s sake, I hope so. I wouldn’t wish on anybody the endless brutal hacking away with a craft knife that I had to employ! The horse figures are badly disfigured as a consequence of this, but at least they (more or less) fit the riders now. I don’t want to trash the set completely as, despite my complaints, I think the figures are beginning to look okay with paint on them, especially when compared to work from certain other manufacturers. And I’m glad to see that the sculptor has depicted the docked tails that was a feature of British Dragoon horses. 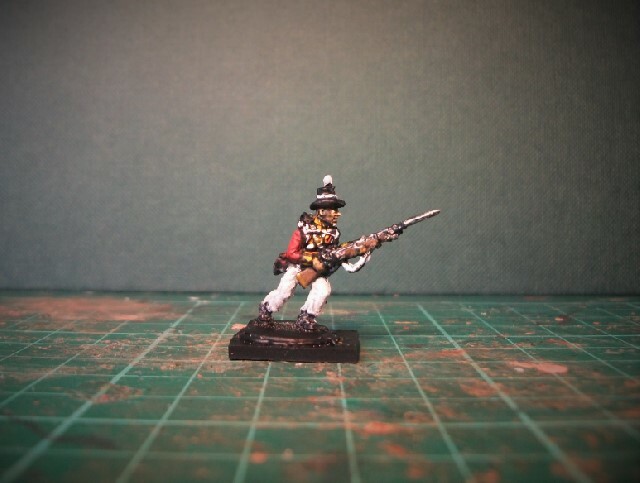 Furthermore, the hobby was crying out for another decent Napoleonic British Heavy Dragoons set to replace the now very rare and rather basic old HaT versions. And I think that the troopers can still be considered an improvement, but, given Waterloo 1815s previously high standards, for me this set has been something of a let down. Next post: Yet another Suburban Militarism day out! 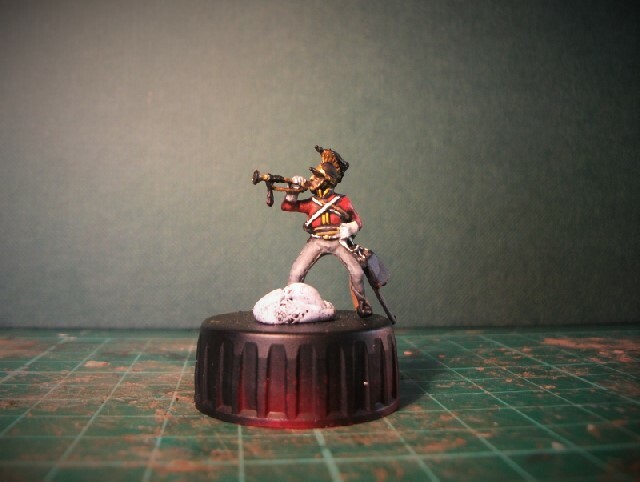 Having despatched those Italeri French dragoons with their fine green uniforms, I’ve now well and truly moved into “redcoat” territory. In fact, I’ve found myself tinkering with no less than three different sets of model soldiers all of whom are wearing British scarlet! 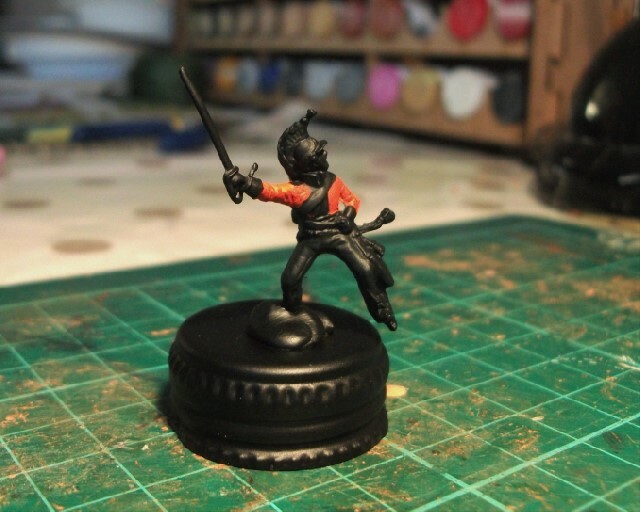 Whenever I initially basecoat a figure using scarlet, it always immediately looks far too vivid. I have to tell myself that once shading and highlighting are applied they will start to look a little more as I intend them to. Or so I hope. The Quiberon Expedition figures I mentioned in a recent post are now underway. They will be a little tricky to paint but, as with all Strelets, despite being an acquired taste, they have plenty of charm and character. 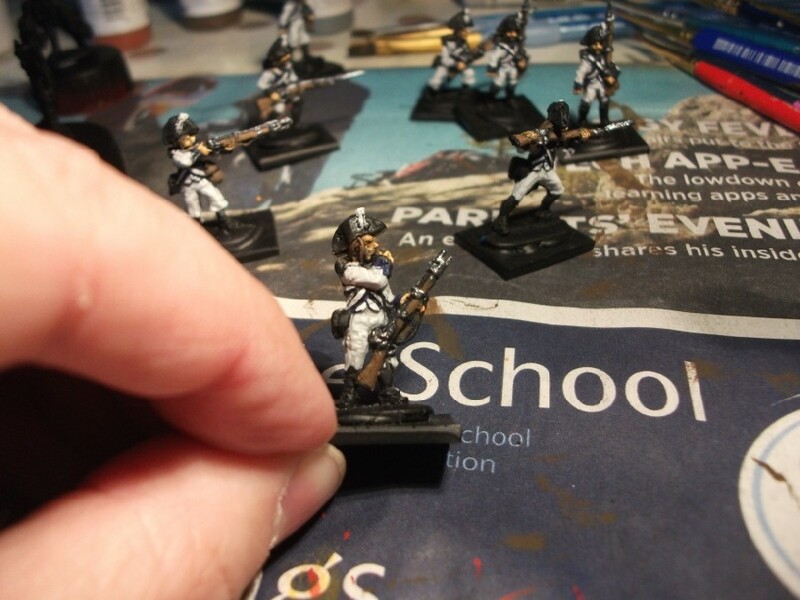 Strelets British infantry being painted as a Royalist French emigre regiment in the Quiberon expedition. 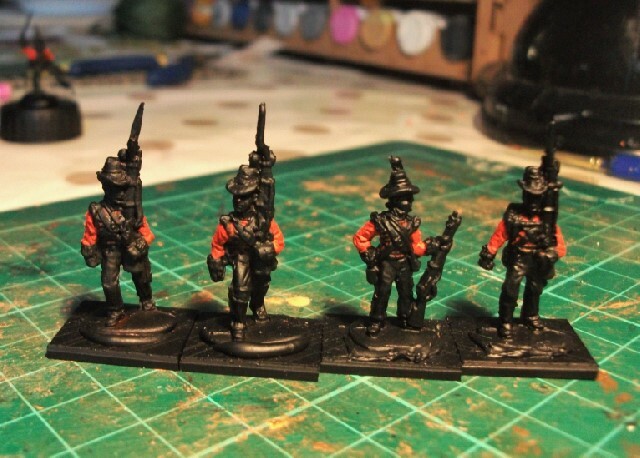 I’m also tentatively having a go at my very first 28mm scale figures. 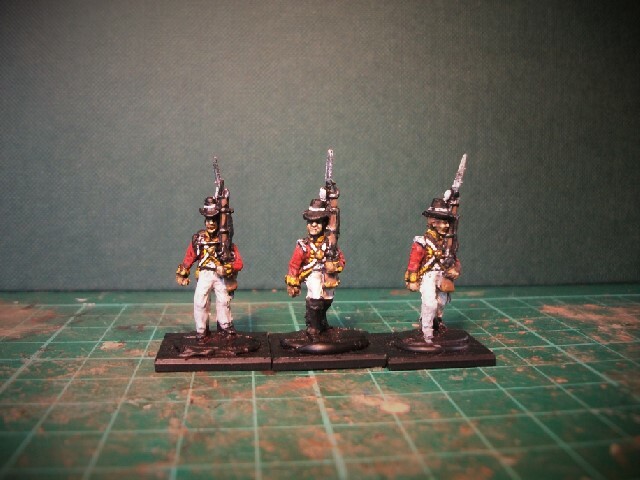 These are early Victorian British soldiers from Perry Miniatures wearing (my personal favourite headgear) the Albert Shako. Being bigger figures they seem at first easier to paint but, at the same time, there’s nowhere to hide for any mistakes or lack of precision! Perry Miniatures British Line Infantry from their “British Intervention Force in North America 1861-68” range. Nevertheless, I am also still firmly committed to my ongoing 20mm Nappy Cavalry Project and have started my next regiment. You guessed it – they are also wearing scarlet! 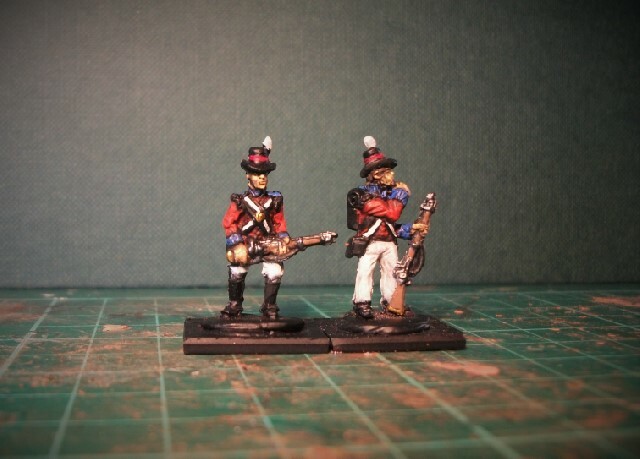 This is a new set only recently released by Waterloo 1815, the British Heavy Dragoons of the 1812-1815 era. I’m planning on painting them as the 1st Dragoons, also known as The Royals. I’ll provide more thoughts on this new set in a later blog entry. Base coat applied. 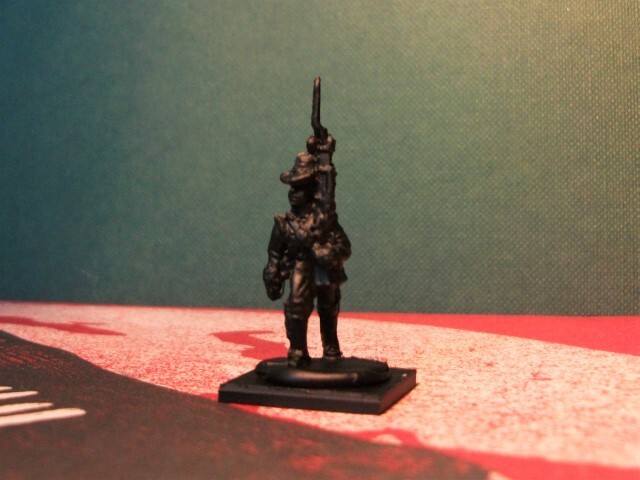 A British heavy dragoon figure from the latest Nappy Cavalry Project regiment. 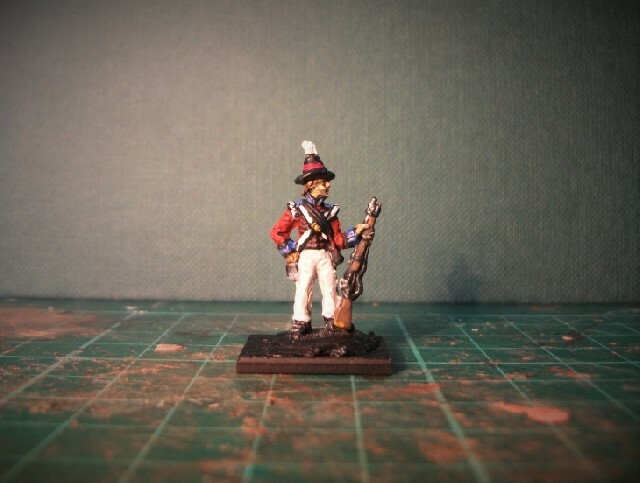 I’ve been tinkering with the French Dragoons and I daresay that they may even be ready by the end of this weekend. I’ve been somewhat distracted, I must admit. I’ve been taking stock and considering future painting plans. I confess that 9 cavalry regiments into the year, I’m finding myself eager to explore different topics and eras. The Quiberon Expedition and the Victorian-era Hurst Castle mentioned in my recent posts have pricked my interest. 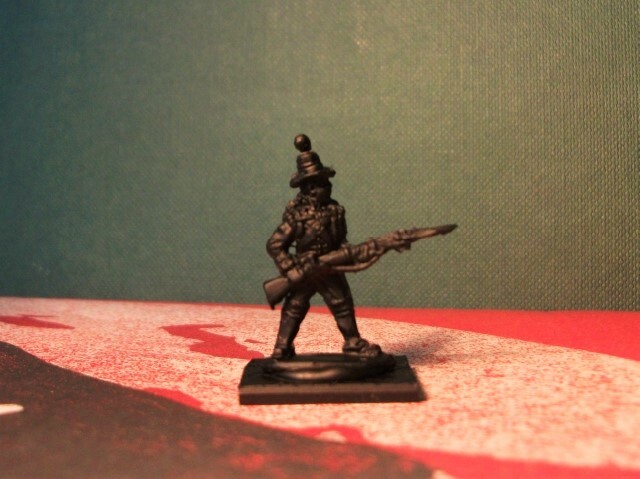 I’ve received the Strelets British Infantry in Egypt set and have tentatively prepared some to paint in my quiet moments. Strelets British Line Infantry in Egypt. As you can see, I had a fairly ‘basic’ but clean painting technique. Enamel paints and gloss varnish used instead of the acrylics and matt varnish that I now have. Back to larger scales might require a change in technique. Something to seriously think about for 2016, perhaps? Enough waffle and pipe-dreaming. Next post will hopefully feature the latest regiment in the Nappy Cavalry Project – the 17th regiment of French Dragoons! Not only did I pay a visit to Hurst Castle, but I also had the pleasure of spending a day at the Royal Navy’s Historic Dockyard in Portsmouth. Suburban Militarism is not a naval blog, so I won’t dwell too much on the visit, suffice to say that seeing Admiral Nelson’s HMS Victory, the Tudor-era wreck of the Mary Rose, and the pride of the Victorian navy’s HMS Warrior was a truly special day out. The Royal Marines fell under the auspices of the navy in 1755, but prior to that were formally part of the army. As such, I feel justified to include something on them here – as Kipling said; “soldier and sailor too”! On board and below decks on the dark HMS Victory, I did sneak a photo of a uniform of the Marines. It’s easy to overlook how much a part these infantrymen played in the victories of the Royal Navy. The infantry element of the Royal Marines were known as the Red Marines on account of their infantry-style scarlet coat, sailors sometimes rudely referring to them as the Lobsters! 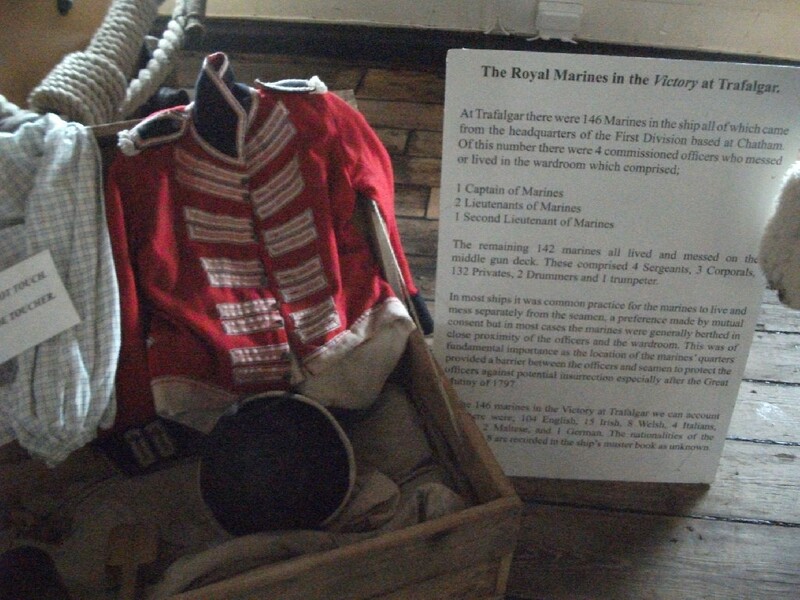 An example of the uniform of the Marines taken on board HMS Victory herself! Later in the week we paid a visit to the local museum in the town of Lymington. I was pleased to find some fascinating information referring to the Quiberon Expedition of 1795, an incident in the French Revolutionary Wars. This was a counter-revolutionary pro-royalist invasion of France by a legion of emigres, sponsored by the British government. Lymington, being a port town just up the river from the Solent and English Channel, was an ideal base for the training and provision of these French exiles prior to an invasion. 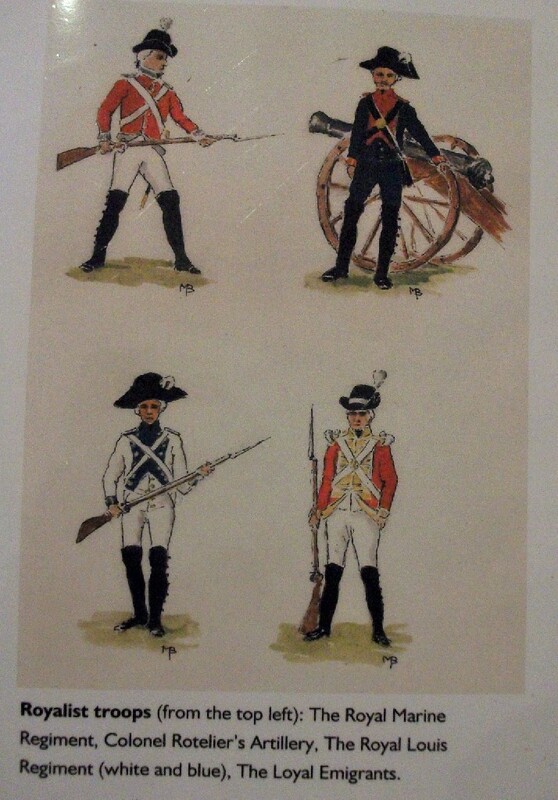 The museum, which also sold a cheap information booklet on the episode, helpfully depicted the uniforms of the royalist regiments with watercolours on a laminated sheet which I photographed and reproduce below: The Royal Louis Regiment wears the pre-revolutionary white common to the royal French army. The Royal Marine and the Loyal Emigrants wear British scarlet, a consequence of having been supplied and equipped by the British government, something that would not help their cause with the French population once the invasion was mounted. The invasion, though initially successful with assistance from the Royal Navy during the channel crossing, fell foul to indecision and infighting between the invasion force and the local Chouan forces. The Chouannerie was a royalist uprising in western France and the Chouans, often fighting using guerilla tactics, would remain a thorn in the side of Republican France right up until 1815. The uprising ended in bloody defeat with the capture of over 6,000 Chouans and emigres, 750 of whom were executed by firing squad. Some 2000 were evacuated by the Navy back to England, many facing hardship and destitution as they settled back into the Lymington area. 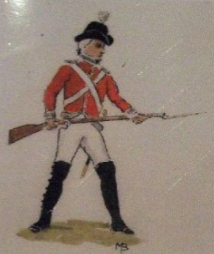 Interestingly, Strelets have produced a kit of British infantry wearing the foreign service style uniforms that the emigres (and some Chouans) were shown equipped with. So, I have purchased a cheap copy of this set and may have a go at some point reproducing a company from a royalist emigre regiment. 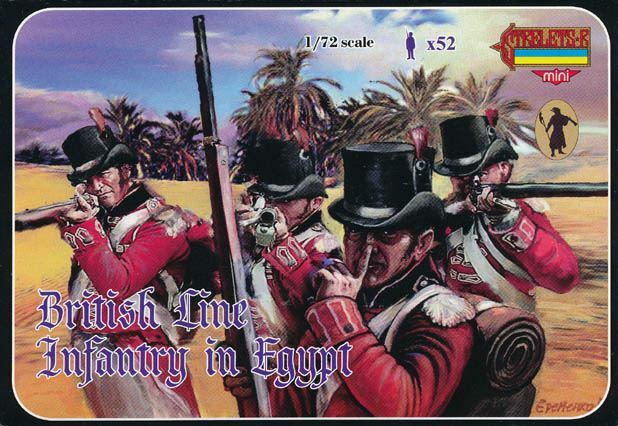 Strelets “British Line Infantry in Egypt”. Suitably inspired by my holiday, I am now able to return to finishing off my French Dragoon regiment that I began before I left. More on that as it progresses!